Paula’s Post#39 – Four days to go! Four days until our ‘Critique Retreat’ begins in beautiful Whistler, British Columbia. Four days, to finish critiquing four, very different novels. But this week, I’m more like One, Two, THREE, Floor. So why is the letter THREE so prominently capitalized in the above sentence? Well, no surprise here, I’m on the road again. Three weeks ago, Vancouver. Two weeks ago, Palm Springs. One week ago, Los Angeles. This week? Yes, with all I have to do, I’m here in my hometown, Portland. And that lovely little ditty above, I learned in the second grade. But in the third grade, we moved to Canada, and Portland is no longer my hometown. Coincidentally, however, it is now my stepson’s home town, and this week I’m here, babysitting our three year old grand-daughter. Hence, the ever so clever, “One, Two, THREE, Floor. As in fall on. Exhausted. I don’t know about you, but I’m the ‘straight-to-grandchildren’ type of grandmother. I like them best when they can talk, when they have their own allowance and instead of screaming because the carrot touched the potato chip, they like to do things like go skiing or to the movies… or to France. Oh wait, that’s where her parents went. Three? A bit more of a challenging. But duty calls and she is cute as all get out, so, instead of ‘critiquing’ 24/7 like my fellow 5writers, I’m packing lunches full of wholesome, organic yoghurt and blueberries and granola, and sorting through an impossible collection of tiny little jeans and dresses to find an outfit ‘her highness’ will deign to wear. Oh, and in between, I’m trying to squeeze in every free moment for critiquing, whenever I can. Which is not very often. Did I mention we’re looking after two elderly, very large dogs, too? But there are worse places to visit than Portland. The ‘City of Roses’ is also the ‘City of Books’. Powell’s City of Books, to be more correct. If you haven’t visited this seven wonders of the world literary outpost, you absolutely must! 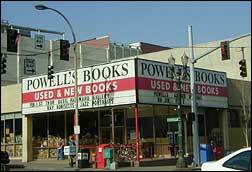 “Powell’s City of Books is a book lover’s paradise, the largest used and new bookstore in the world. Located in downtown Portland, Oregon, and occupying an entire city block, the City stocks more than a million new and used books. Nine color coded rooms house over 3,500 different sections, offering something for every interest, including an incredible selection of out-of-print and hard-to-find titles. I’m sitting across from there now. At Starbucks. Thank God for Starbucks – the only place I’ve managed to get any work done. Thank God for free WiFi. But back to Powell’s. I don’t dare go in. I’d never leave. The minutes stretching into hours as I perused the miles of bookshelves. But, I wanted to tell you about it, just in case you find yourself in Portland with a few hours, or weeks to kill, with no deadlines looming and no three year olds clinging. A funny thing happened when I looked up the web address for Powell’s. I discovered Powell’s has an Espresso Machine. So what, you say? Big deal. It’s Portland. A city that threatens to out caffeinate Seattle, when it comes to the Barista Olympics. This isn’t just any Espresso Machine. It is an Espresso Book Machine. 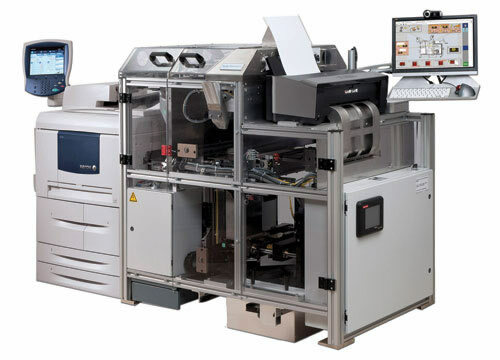 A machine that steams out books like an espresso machine makes coffee. According to Powell’s webpage, now you, too, can be self-published just like D.H. Lawrence, Gertrude Stein, Walt Whitman and Beatrix Potter. Only you won’t have to wait quite as long. I don’t know for sure, but I think my 5writers colleagues are mostly traditionalists, aiming for agented representation and a name publishing house. But just in case it doesn’t work out for each and every one of us, it is nice to know we now can have a back up plan. Now, if they could just invent a machine that could manufacture critiques!